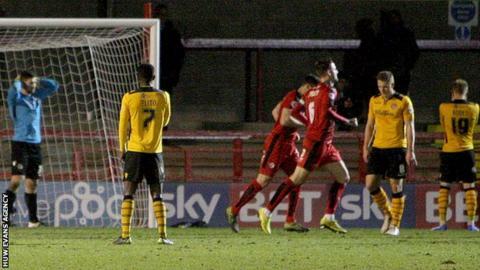 Crawley completed a double over Newport County with a comfortable 2-0 victory. The Reds had failed to score more than once in their previous 10 League Two games, but were dominant against Warren Feeney's side. County striker Scott Boden opened the scoring at the wrong end when his header beat Joe Day after 36 minutes. Shamir Fenelon then headed home eight minutes after the break, before Newport's Medy Elito was sent off with five minutes left for two yellow cards. "It was disappointing, I don't think we got going from the first whistle, we couldn't get into a rhythm and our passing was poor," Newport manager Feeney told BBC Radio Wales. "We have to put it to bed and move on to the next game, we are still in a fantastic position to avoid relegation and that is still my aim. "You have ups and downs in a season and this was a down, the worst performance since I have been the manager. No-one likes to get beaten." Match ends, Crawley Town 2, Newport County 0. Second Half ends, Crawley Town 2, Newport County 0. Substitution, Crawley Town. Roarie Deacon replaces Shamir Fenelon. Foul by Andy Bond (Crawley Town). Conor Wilkinson (Newport County) wins a free kick on the right wing. Attempt missed. Conor Wilkinson (Newport County) left footed shot from outside the box is high and wide to the left. Substitution, Crawley Town. Bobson Bawling replaces Lanre Oyebanjo. Second yellow card to Medy Elito (Newport County) for a bad foul. Shamir Fenelon (Crawley Town) wins a free kick in the defensive half. Foul by Medy Elito (Newport County). Corner, Newport County. Conceded by Lanre Oyebanjo. Attempt blocked. Matt Harrold (Crawley Town) left footed shot from the centre of the box is blocked. Substitution, Crawley Town. Lewis Young replaces Gwion Edwards. Delay in match Shamir Fenelon (Crawley Town) because of an injury. Foul by Shamir Fenelon (Crawley Town). Medy Elito (Newport County) wins a free kick in the attacking half. Substitution, Newport County. Jake Gosling replaces Yan Klukowski. Attempt saved. Matt Harrold (Crawley Town) header from the centre of the box is saved in the top centre of the goal. Corner, Crawley Town. Conceded by Darren Jones. Lyle Della Verde (Crawley Town) is shown the yellow card. Conor Wilkinson (Newport County) is shown the yellow card for a bad foul. Gwion Edwards (Crawley Town) wins a free kick on the left wing. Foul by Conor Wilkinson (Newport County). Attempt blocked. Charles Dunne (Crawley Town) right footed shot from the centre of the box is blocked. Medy Elito (Newport County) is shown the yellow card for a bad foul. Frankie Sutherland (Crawley Town) wins a free kick in the defensive half. Sonny Bradley (Crawley Town) wins a free kick in the attacking half. Foul by Jon Ashton (Crawley Town). Scott Boden (Newport County) wins a free kick on the left wing. Attempt missed. Lyle Della Verde (Crawley Town) left footed shot from outside the box is high and wide to the left. Jon Ashton (Crawley Town) wins a free kick in the attacking half. Substitution, Newport County. Janoi Donacien replaces Ben Davies. Substitution, Newport County. Dean Morgan replaces John-Christophe Ayina. Scott Boden (Newport County) wins a free kick in the attacking half. Ben Davies (Newport County) is shown the yellow card for a bad foul.